Windows taskbar is a bar located at bottom of the screen from where we launch and monitor running programs. Windows 7 taskbar is little advance and so it is also called Superbar. Let’s do some tweaking with Windows 7 taskbar. By default Windows uses medium size icon for programs in taskbar. But let’s make this icon smaller. Right click anywhere on the blank space in the taskbar and select Properties. The Taskbar and Start Menu Properties window will open. Check “Use Small Icon” option and click Apply button and then OK button. All icon in taskbar will now appear small. Using auto hide feature, the taskbar will automatically hide itself. It will appear only when you mouse over the hidden taskbar region. The Taskbar and Start Menu Properties window will open. 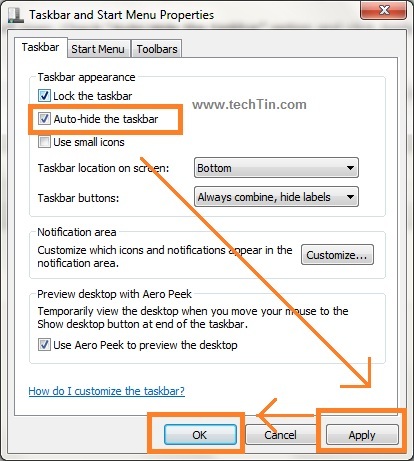 Check “Auto-Hide the taskbar” option and click Apply button and then OK button. By default windows 7 taskbar is located at bottom of screen. But you can change this location and move taskbar to top, left, right, bottom of the screen. The Taskbar and Start Menu Properties window will open. 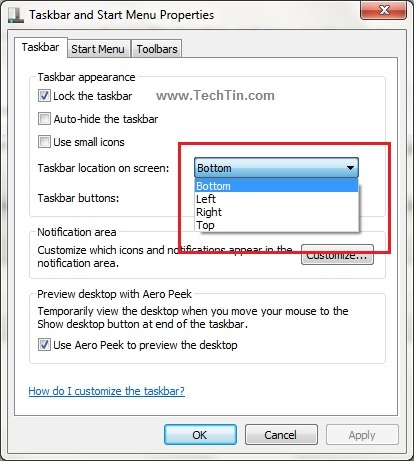 Here you can select location for taskbar. 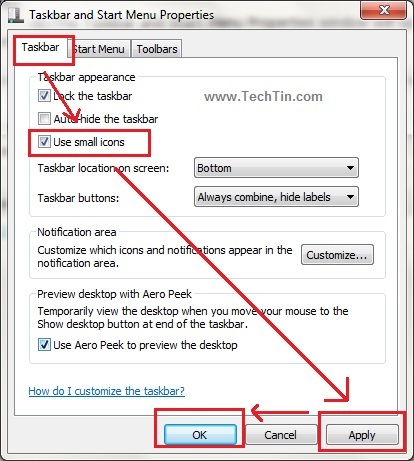 There are few more simple tweaks related to windows 7 taskbar. I will soon come with more tutorials related to taskbar.